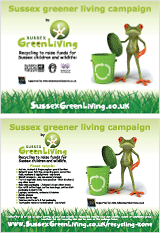 Sussex Green Living is a Green community network which aims to inspire and motivate families to lead a more environmentally friendly life. We have a website, active Facebook page, children’s educational club and an information stand which we take to events. We encourage parents, children, carers and teachers to connect with nature and wildlife, to share ideas about how we can protect our planet and live a more sustainable lifestyle. We hope to equip people with practical and creative solutions to show them that they can always make a positive difference to the planet. In doing this we can help build sustainable communities which are vibrant, healthy and safe, which respect the local and global environment – places where individuals and enterprise can prosper. Our vision is of a world where every person lives within their environmental limits. Working towards even more sustainable communities for future generations. We are ethical and responsible in all of our business endeavors, all the time. We treat each other with honesty and respect. We recognize that what we have and what we will achieve is through the efforts of our employees and members. We are dedicated to understanding and anticipating the needs of our members and customers and helping them to achieve their life and business objectives. We recognize that our business impacts the environment. We are committed to continuous environmental improvement and the prevention of pollution. We will be in compliance with all environmental laws and regulations. We recognize our responsibility to contribute to the betterment of the communities in which we operate and the world in which we live. Everyone can make a difference in a positive way. Achievable steps every day can make a difference. We believe a more sustainable world is a better world for everyone, human, the planet and nature as a whole. Forward your suggestions for events, videos, parks and green spaces etc to be added to “your” site.